In a season for the Browns that has actually held more good news than bad for once, Brian Hoyer‘s season-ending ACL tear notwithstanding, the team got another dose of good news on Monday-they will not have to turn back to Brandon Weeden once again at quarterback. 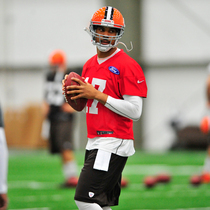 X-rays showed Jason Campbell‘s ribs are bruised but not broken according to Mary Kay Cabot of the Cleveland Plain Dealer. Campbell could practice as early as Tuesday, although there seems to be no need to rush him back as the team entere its bye in Week 9. Campbell is fully expected to be under center when the Browns face division rivals the Cincinnati Bengals in Week 10. Brown hurt his ribs in the first quarter Sunday on a hit by Ravens nose tackle Haloti Ngata but returned to complete 23-of-35 passes for 262 yards. The Browns are actually in the playoff hunt for the first time in a long time and already have a win this season over the division-leading Bengals.